A call or a put option with a payoff based on the relative outperformance of one asset over another for a specified amount invested. Also known as exchange or spread options. Both European and American are available, and can be cash or physically settled. Typically they are European and cash delivered. Can be written on equities, bonds, and currencies. Can be purchased on exchanges, but is primarily traded in the OTC. 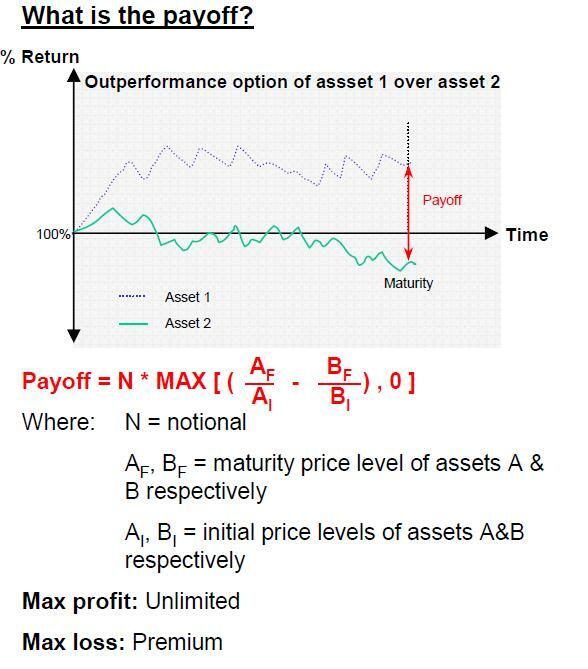 At maturity, the percentage return of the two assets with respect to their initial price levels are observed. In the event the asset thought to outperform actually underperforms, the payout is zero. Useful for investors who wish to gain leveraged exposure to the performance of one asset over another with limited downside. Can be used by structured products traders to hedge correlation exposures. Essentially outperformance options rely on the correlation views of the client. If they are long the call, then they will make money out of a drop in correlation because it widens expected returns. Initial levels of the two indices are just as important as the final levels in order to determine the payoffs. Thus the timing of a purchase or sale is an important consideration. Outperformance options can be used as an alternative to equity performance swaps. Enables investors with more confidence to predict the relative performance than absolute levels to take a position. Relatively low in cost terms in relation to the magnitude of the potential upside. When the implied correlation between two assets are greater than +0.5, then outperformance option is cheaper than a plain vanilla call on either of the two indices.